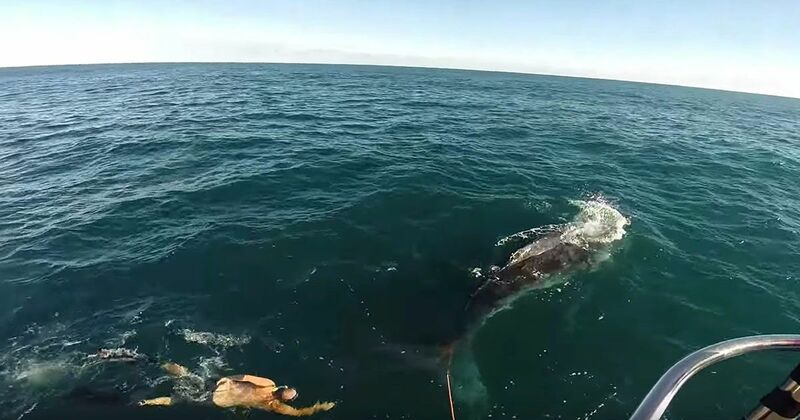 When New Zealand charter boat skipper Joe Brogan and his crew encountered a baby humpback whale tangled in cray pot lines off the coast of Western Australia, he didn’t hesitate to leap into action. This jaw-dropping video shows the crew giving calm direction from the boat, enabling the brave skipper to swim out to the helpless creature and use his knife to cut the ropes from around it. The footage captures the moment that the relieved young calf is finally released to swim away to safety. It could have been a very different story if Joe and his crew hadn’t been on hand to help. Sharks are frequently spotted off the Geraldton coast, around 400 kilometers north of Perth. "That is a meal on a string for a great white shark, they love them," Joe told the ABC Mid West WA. "It was going to drown, or it was going to get eaten." Joe’s father wasn’t surprised that his son came to the rescue, telling Newshub NZ that Joe would have acted on instinct and not paused to think about what he was about to attempt. With humpback whales once almost hunted to extinction, that moment on the video when this youngster is seen swimming away to freedom seems all the more magical.